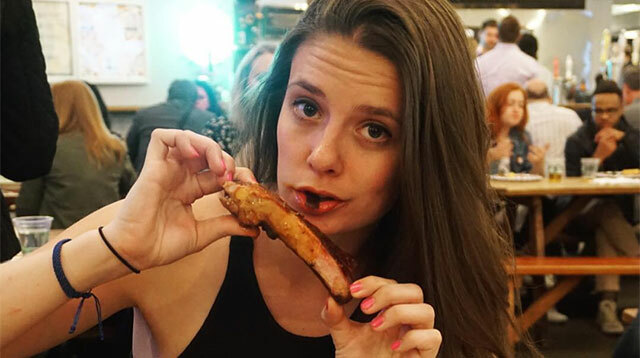 Food blogger Rebecca Raben eats whatever the hell she likes, but manages to not put on weight. But how? If you go on her Instagram, I Actually Ate That, you'll see photos of all the incredible food she eats (seriously – check it out if you fancy getting stuck in an Instagram hole for a while). But according to her it doesn't matter what food she eats, it's how she eats it that helps her maintain a weight she's happy with. "I was raised on eating what makes you happy—for me, that's a ton of tacos, nachos, late-night pizzas, bagels, pasta and the works," Rebecca says in a new interview with the New York Post. "I'm basically a cow with five stomachs." "I treat food as something you enjoy, not gorge on," she explains. "I never order seconds. If I'm having a delicious pasta, I'll take my time and eat it—there's no point in eating the same thing twice." So she takes her time eating so her brain knows she's full, and doesn't think she just wants to keep stuffing her face. Registered dietitian Jessica Cording's on board with Rebecca's mindset. "I love it," the New York-based R.D. told SELF. "This can work very well because you don't feel deprived." She added it feels like you're treating yourself so it takes away some of the pressures of traditional dieting. And as a result, she's found that when following this guideline, most people are more likely to indulge without losing control because "the forbidden fruit aspect isn't there."